I simply don't get the meaning of the sentence and I'm especially confused about the last part, "Page 14 News". I find that part unrelated to the rest of the sentence. "Front page news" is a synonym for the important or notable story. It's the news that's important enough to put on the cover of the newspaper. So, page 14 news would be, in comparison, very unimportant, or not at all noteworthy, novel or interesting. The irony is that a massive attack on the Pentagon would be expected to be all of those. Unless of course, it is happening often. Or perhaps if the Pentagon had ceased to be seen as important. 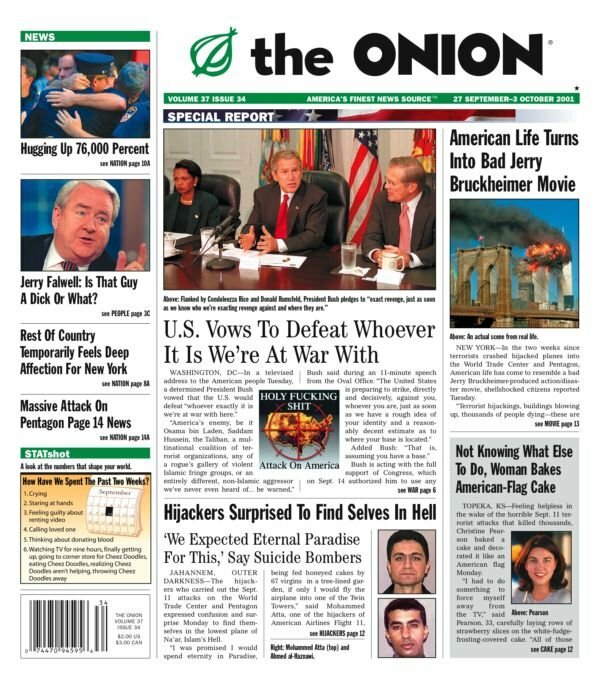 Edit: I was half-asleep when I originally wrote this, and hadn't spotted the fact that the item in the Onion was a contemporaneous report on 9/11. So the irony is that so many massive attacks have happened that an attack on the Pentagon is being "buried" on page 14. In addition to the satirical content as explained by Euan M, the grammatical meaning may not be immediately obvious because it's written in headlinese. There's implicitly an "is" between "Pentagon" and "Page", so in plain English the headline would be "[A] Massive Attack On [The] Pentagon [Is] Page 14 News". This example could be especially confusing since it's a headline about a headline, which isn't very common. There is (in fact) a good amount of speculation here about grammar, headlines, insinuation and what my dad used to call "maybe...if". That is all "well and good" (enough)... maybe. Insight might be gained into the "deeper meaning" of the headlines, sarcasm (Onion, was it?) to review the events of the day as well as the one before. Rumsfeld reported 2.3 trillion missing from the Pentagon Budget on the day before: September 10th. On September 11th the Pentagon was INDEED hit... in the financial office. This might be a good reason to either bury news of this on page 14 (deliberately, if in fact, it was really done) or (Onion) sarcastically. For some folks, "connecting the dots" is not easy at all in the case of things with which they are not familiar or areas which may not be their expertise. Following the link sends me to a Newsweek article, from early October, 2001. It's an interview with Onion writer who says they took a week off from writing ANYTHING. He is listing things they thought they WOULDN'T be able to write, because ANY sarcasm just wouldn't have been "fitting". How differently these things are viewed today. Not the answer you're looking for? Browse other questions tagged sentence-meaning phrase-meaning headlinese jokes or ask your own question. I don't get this cartoon! Pem“broke”? What does ''sun-dappled yoga pose''and ''hour 11 manning the deep-fat fryer'' mean?